The following are a few pictures from this trip and the one that I took with Cousin, my folks. 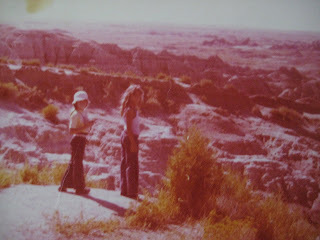 Sister-in-law gave me a box of old pictures, and I had a few, but not all of the trip from thirty years ago. I can piece together a few similarities. I guess there are, simply, picturesque shots that everyone seems to gravitate toward. 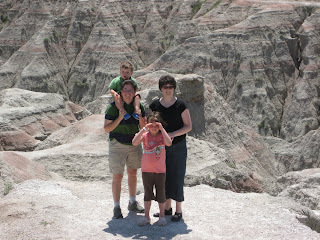 The first two are from the badlands. I'm in the white hat (I LOVED that hat). 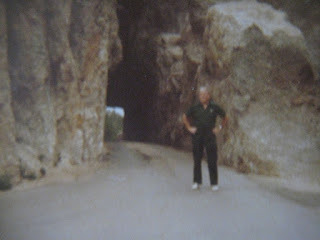 The third is my dad standing at the entrance of a tunnel in the Needles. 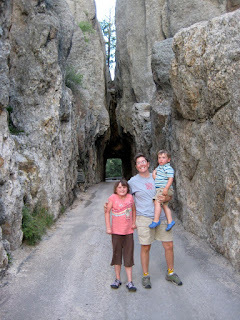 I believe the picture that follows is at the opposite side of that very same tunnel. 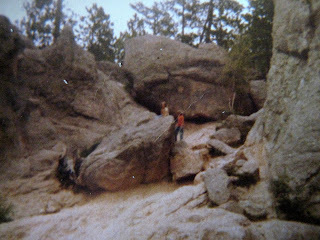 This last picture is Cousin and I in the needles, moments before getting lost. I know now where we were, but that is not where Big and Eight and I chose to climb.